POJO (Plain Old Java Object). This acronym is similar to POTS (Plain Old Telephone Service) — POTS. 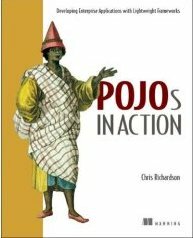 POJOS are Plain Old Java Objects. The trend is to work with POJOs rather than heavyweight objects. Hibernate, Spring, JDO, iBATIS and even EJB version 3 use them. The book covers using POJOs in business logic, accessing a database, managing transactions and handling database concurrency.